The fibromyalgia diet includes foods that help to reduce chronic pain, tender points, fatigue, and other symptoms of fibromyalgia. Whole foods, plenty of vegetables, and healthy fats are all part of the foods to eat on a fibromyalgia diet. There are also some supplements like omega-3, D-ribose, and turmeric that are good for fibromyalgia sufferers. The fibromyalgia diet can also help to reduce the frequency and intensity of fibromyalgia flare-ups. Many doctors are of the opinion that some foods trigger fibromyalgia flare-ups. That is why the fibromyalgia diet also avoids certain foods containing sugar, monosodium glutamate (MSG), and other foods known to cause inflammation. In this article, you will learn about the fibromyalgia diet and how eating the right foods can help manage your symptoms. At the end of the article, you will find out about natural ways to help prevent frequent fibromyalgia flare-ups. Fibromyalgia (FM) is a chronic condition that causes widespread muscle pain, joint pain, and fatigue. Signs of fibromyalgia include widespread pain with no discernible cause, sensitivity to touch, extreme fatigue, brain fog, mood disorders, and trouble sleeping. With fibromyalgia, you may also feel like you have stiff, aching joints that make walking, sleeping, or exercising sore and painful. Fibromyalgia pain can be acute (short-term) or chronic (long-term). Chronic pain associated with fibromyalgia can last for many weeks and can greatly impact on your quality of life. Fibromyalgia flare-ups describe a sudden worsening of your symptoms that are usually caused by a trigger. Many FM suffers say that a fibromyalgia flare-up can feel like a sudden increase in the intensity of your muscle or joint pain. During a fibromyalgia flare-up, you may feel that it is difficult to concentrate (fibro fog) and your mood drops significantly. During fibromyalgia flare-ups, you may feel as if you don’t want to do anything at all, and even the simplest of tasks become difficult. The chronic pain associated with fibromyalgia usually comes and goes. However, flare-ups are inevitable and can leave you feeling depressed and discouraged. 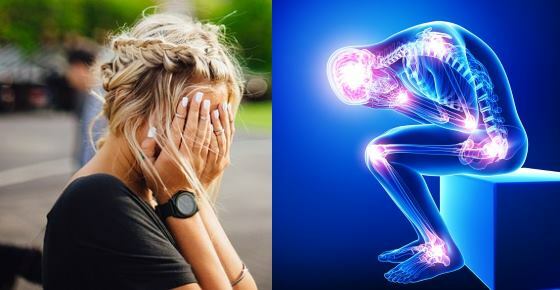 Although there is no specific diet for fibromyalgia, there is a connection between the food you eat and symptoms of fibromyalgia. To know which foods to avoid with fibromyalgia and which food to include in your diet, you should keep a food diary. Foods to include on a fibromyalgia diet should include lean protein, plenty of fruits and vegetables, and whole grains (choose gluten-free grains such as quinoa, oats and brown rice). These types of foods help to give you energy and are good for your overall health. For example, if eggs don’t aggravate your fibromyalgia symptoms, an egg in the morning with wholemeal bread can give you energy and prevent blood glucose spikes. You may also want to add supplements like D-ribose, melatonin, turmeric, or omega-3 to your fibromyalgia diet. A diet that helps you cope with chronic pain needs to include plenty of fruits and vegetables. Fresh vegetables are a storehouse of vitamins, minerals, antioxidants, and fiber that will boost your health. Scientific research has also shown that the best diet for fibromyalgia should include vegetables. If you can’t go vegan or vegetarian, try to increase the number of fruits and vegetables in your diet. Also, try to reduce your intake of red meat and get as much of your protein as you can from nuts, lentils, beans, and quinoa. Find out about more meat-free sources of protein that can help keep you healthy and may even reduce the number of fibromyalgia flare-ups. When choosing the best foods to eat if you have fibromyalgia, you should eat foods that have gone through as little processing as possible. If you choose to eat meat, then opt for skinless chicken breast or other lean protein with fresh vegetables rather than processed, pre-prepared meat. Consuming foods that have been processed as little as possible helps to ensure you get enough nutrients, fiber, and healthy fats in your diet. Learn more about the dangers of hidden sugar, sodium, and trans fats that are in processed foods and which aggravate chronic inflammation. Depending on your symptoms, your fibromyalgia diet should contain foods that don’t cause a lot of fermentation in your digestive tract. The term FODMAPS stands for fermentable oligosaccharides, disaccharides, monosaccharides, and polyols. These are a collection of simple and complex carbs that aren’t absorbed effectively in your gut and may cause digestive problems. Following the low-FODMAP diet for fibromyalgia involves eliminating all foods in the FODMAPS list and then gradually re-introducing them into your diet. This helps to identify foods that may aggravate your fibromyalgia symptoms. Some of the best foods to eat if you have fibromyalgia should be rich in minerals like magnesium, calcium, manganese, and iron. Learn more on how to prevent a magnesium deficiency naturally and where you can find the best sources of calcium from non-dairy products. A healthy diet for fibromyalgia should also include natural sources of iron. Many websites suggest that lactose found in dairy products can aggravate fibromyalgia symptoms. Although there is no direct research to support this, if diary consumption worsens your condition, then opt for dairy alternatives. However for some fibromyalgia sufferers, eliminating dairy from the diet has led to an improvement of their symptoms, whereas for others, dairy doesn’t seem to worsen fibromyalgia. It is good to avoid foods containing refined carbs if you have fibromyalgia. Foods containing added sugar and refined grains (white flour) are not recommended on the fibro diet. Learn more about the function of carbs and how healthy, complex carbohydrates can be a good source of vitamins and fiber. One way to help prevent inflammation in your body that can lead to chronic pain is to include healthy fats in your diet. A healthy, well-balanced diet should include fats because they are a source of energy and help to absorb vitamins and minerals. Learn more about the amazing anti-inflammatory properties of extra virgin olive oil. As well as choosing the right foods for a fibromyalgia diet, you could also supplement your diet with nutrients to help prevent flare-ups. D-ribose is a type of sugar that can help prevent muscle pain, cramping, and stiffness in people with chronic fatigue and fibromyalgia. Learn more about the benefits of D-ribose supplements in your diet if you have fibromyalgia or chronic fatigue syndrome. Omega-3 fatty acids help to reduce inflammation in your body and can improve your cardiovascular health. Learn more about the many health benefits of adding omega-3 to your diet to help reduce pain and inflammation. Turmeric is good for fibromyalgia because it helps reduce and manage chronic pain and inflammation. This is mainly due to curcumin which is the main active ingredient in turmeric. Find out more about this amazing spice that can help to transform your health. Supplementing your fibromyalgia diet with creatine can help to improve muscle function in fibromyalgia. Taking melatonin supplements along with foods for fibromyalgia can help deal with chronic pain and make you sleep better. This nutrient acts as an antioxidant, which protects cells from oxidative damage and plays an important role in metabolism. However fibromyalgia sufferers seem to have lower levels of CoQ10 (39, 40). One way to help lessen the frequency and intensity of fibromyalgia flares is to avoid foods that can cause inflammation and aggravate chronic pain. Sugar and “hidden sugars” are some of the foods that can trigger fibromyalgia pain. Learn how to add sweetness to your foods and drinks naturally by using fresh or dried stevia leaves. Some researchers have found that there is a link between gluten and fibromyalgia. Do you know how to spot the signs of suffering from gluten sensitivity? Learn how you can add quinoa to your fibromyalgia diet to avoid gluten and increase your protein intake. Just as there are some foods that help to reduce the symptoms of fibromyalgia, so there are other foods that can cause fibromyalgia flare-ups. These unhealthy foods may not only aggravate your fibromyalgia symptoms but also have a detrimental impact on your health. Make sure that foods in your fibromyalgia diet don’t contain the food additive monosodium glutamate (MSG). Find out more MSG and some of the other dangerous ingredients that can be lurking in your food. It is important to find ways to manage your symptoms and fibromyalgia flare-ups. A fibromyalgia diet plan specific to your dietary needs and condition can help to alleviate many of the symptoms. Let’s look at what scientific research says about other ways to treat fibromyalgia and chronic pain naturally. Researchers recommended exercise regimes specific to each person with fibromyalgia, as FM patients may be in pain or poor physical shape. Getting enough sleep is essential to prevent aggravating your fibromyalgia condition and lessen the number of flare-ups. Researchers also noticed that sleep deprivation can be a fibromyalgia trigger. Stress is a well-known fibromyalgia trigger and therefore, knowing how to relax is an important tool for managing chronic pain.